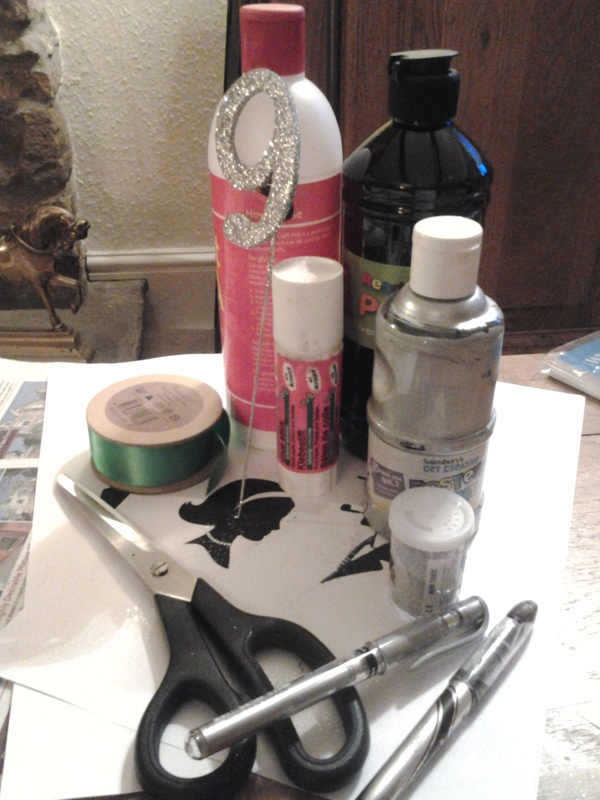 These photos are of the supplies I needed to create this year’s birthday cake masterpiece for Master M as, after all, this had to be a birthday cake like no other I’ve ever baked before. In the same way that I had discussed my plans for the food we would serve at their Cluedo party with M, we sat together to talk about the various options for his birthday cake. 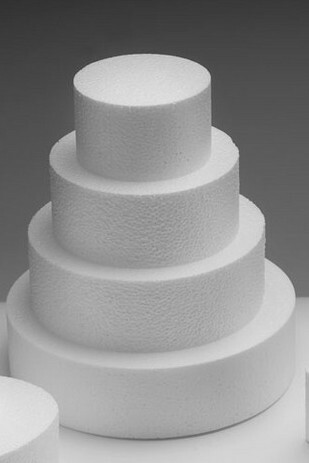 I could bake a “normal” cake for him to give to his friends, I could use polystyrene dummy cakes to create an authentic-looking, but totally M-friendly cake or we could try something completely different. A friend had suggested using small bottles of 7-up to create a tiered cake and then giving every party guest a bottle to take home, which I thought an inspired idea as it’s one of the few things M has been able to enjoy since his NG-tube was passed, but M disagreed. He preferred the idea of the polystyrene “fake” cakes and we headed off to the shops over half-term to source the cakes, decide how many tiers he wanted and get all the art supplies I might need. 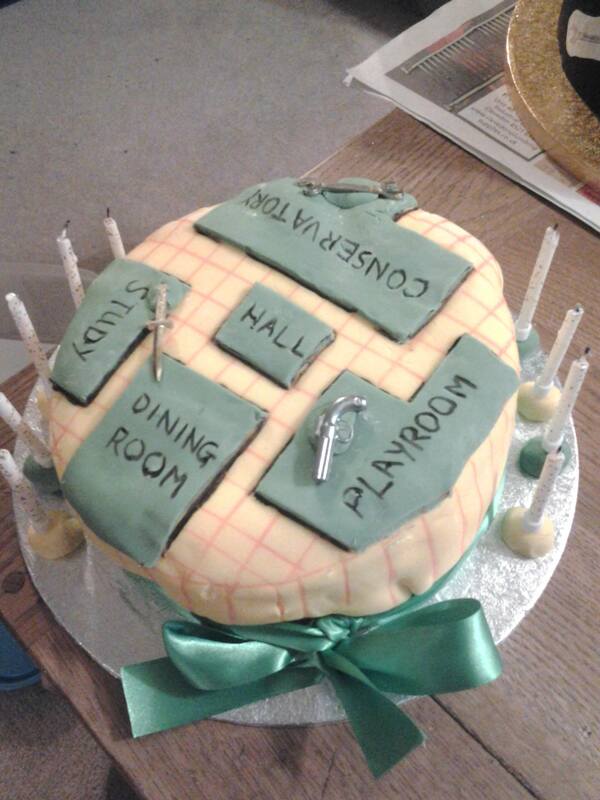 Every year I try to create birthday cakes that either echo the themes of the parties themselves, be that mini-golf, magic or minions; or that are innovative and something the children have never seen before, such as last year’s pinata cake for G. This year’s Cluedo theme offered me a wealth of ideas and I just needed to decide how to put them into action. 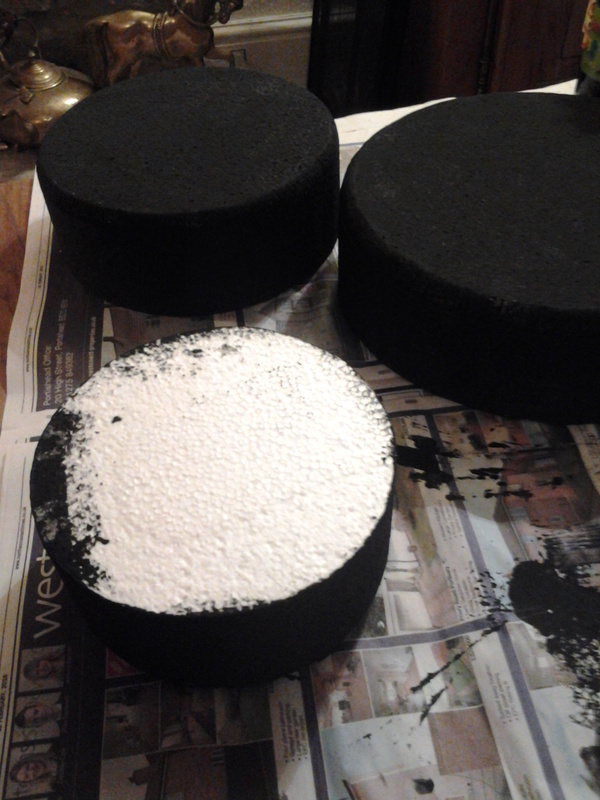 I settled on a black base layer and ever-grateful to avoid the nightmare of icing a free-from cake, attacked our 3 tiers with a sturdy brush and bottle of black paint. 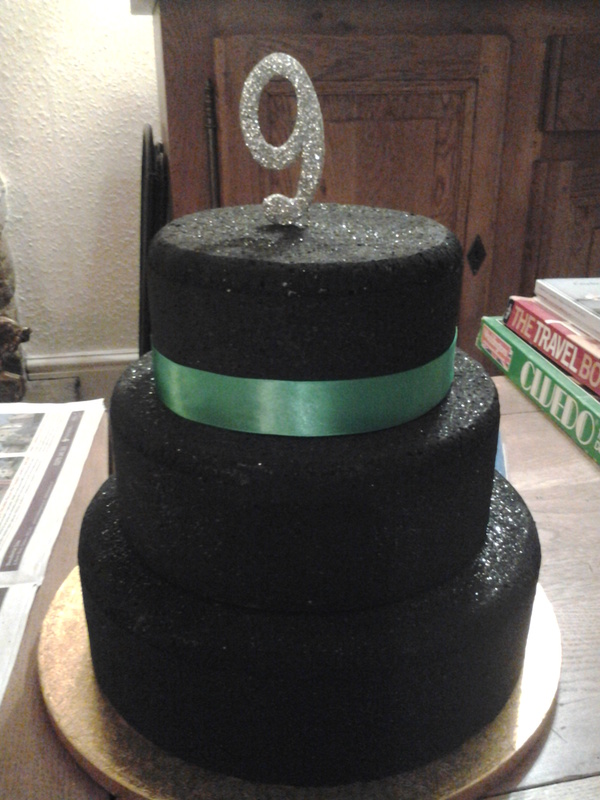 “Cakes” fully covered, I liberally sprinkled some silver glitter over them all before the paint dried, positioned the silver 9 on the top and added an emerald green ribbon trim for that touch of old-fashioned glamour and to fit with M’s role as party host, “Captain Emerald”. I stuck the tiers together using PVA glue and then inserted some wooden skewers, just to make sure there was no chance the cake would fall apart before the day itself. Next came the fun part of adding the decorations. I had previously printed out silhouettes to use for the characters and images for each of the murder weapons and had a number of them left-over after I had prepared the cards for the party itself. Choosing carefully, I glued the weapons to the bottom layer and a selection of characters to the middle layer, making sure I included the image of G’s character, “Countess Pearl”. 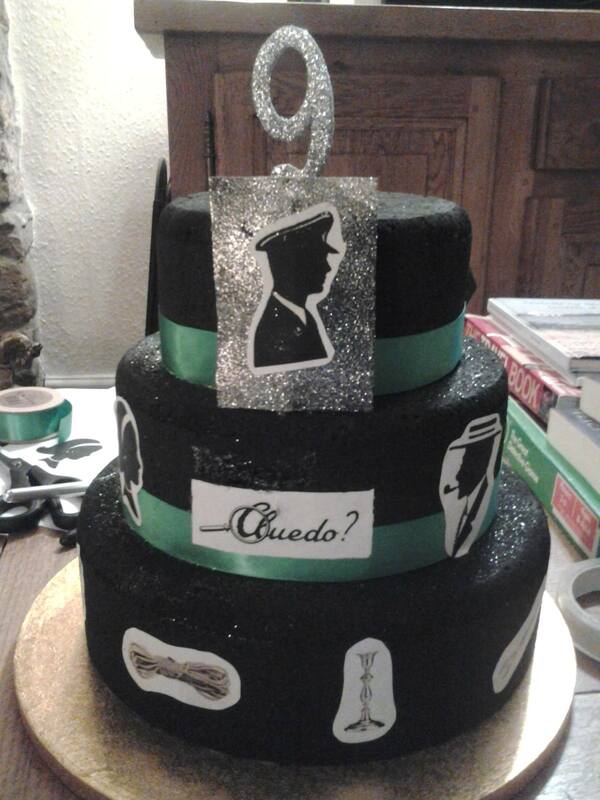 My final step was to stick Captain Emerald’s silhouette to a piece of black card that I had already covered generously with more silver glitter and added this, leaning against the top-tier of the cake, before leaving it all to dry. M’s cake sorted, I moved on to the preparation of a cake for G. Much as I had enjoyed exploring the “crafts” side of my personality, this was the moment I’d been waiting for since Christmas. 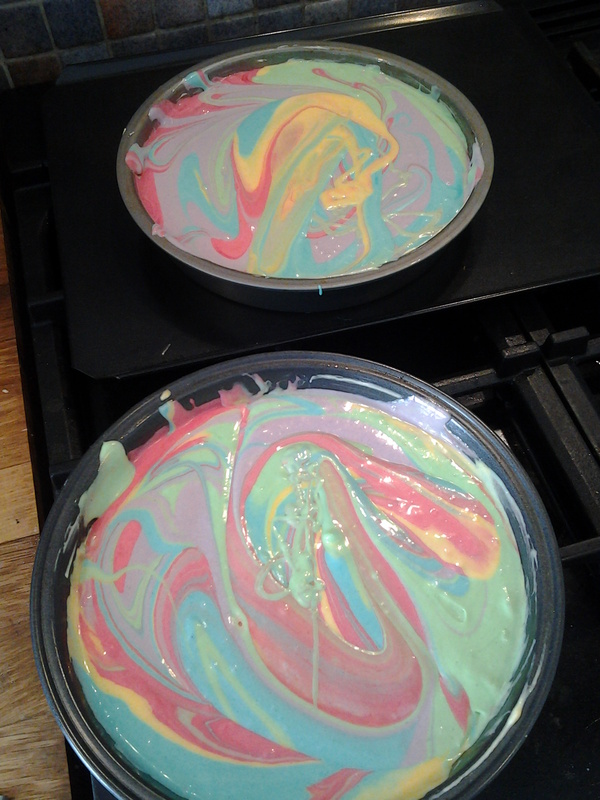 Not so much the baking of a cake, though I love decorating birthday cakes to wow my children, but more because I finally got to use the best Christmas present I had received and one that was completely unexpected. I’ve been drooling over the KitchenAid food mixers for years, imagining one gracing my kitchen counters and last year started saving towards buying one of my own. To my delight, and absolute surprise, my wonderful Mum invested in a Ice-blue model as my Christmas/birthday present and it’s been sitting in the kitchen, taunting me daily with its absolute beauty, whilst I’ve waited for a chance to take it for a test-run. 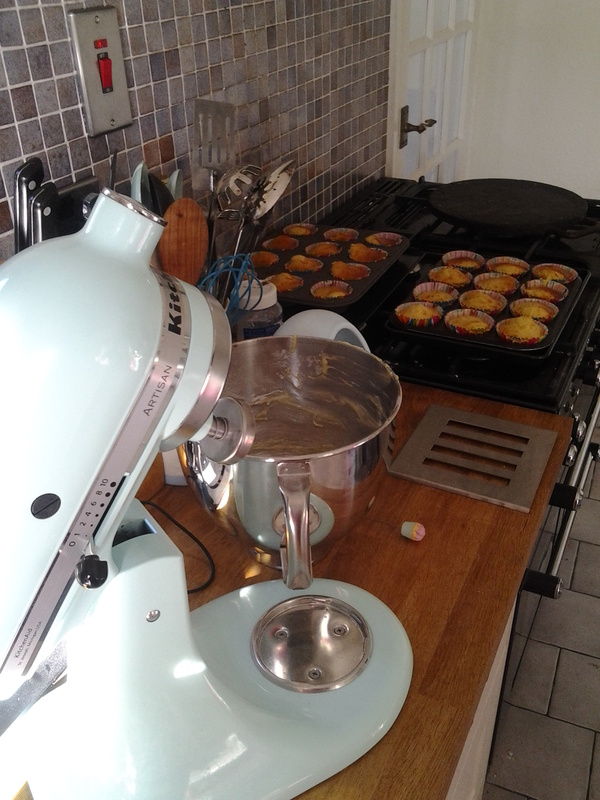 All I can say is thank goodness I needed to whip up 24 G-friendly cupcakes as well as the birthday cake itself as I flew through the first task and loved every moment spent doing it! My birthday cake challenge was easier this year as although G has allergies of her own, I was able to use eggs, an ingredient I haven’t baked with in over 3 years. I used a simple gluten- and dairy-free recipe and then split the mixture between 5 bowls. 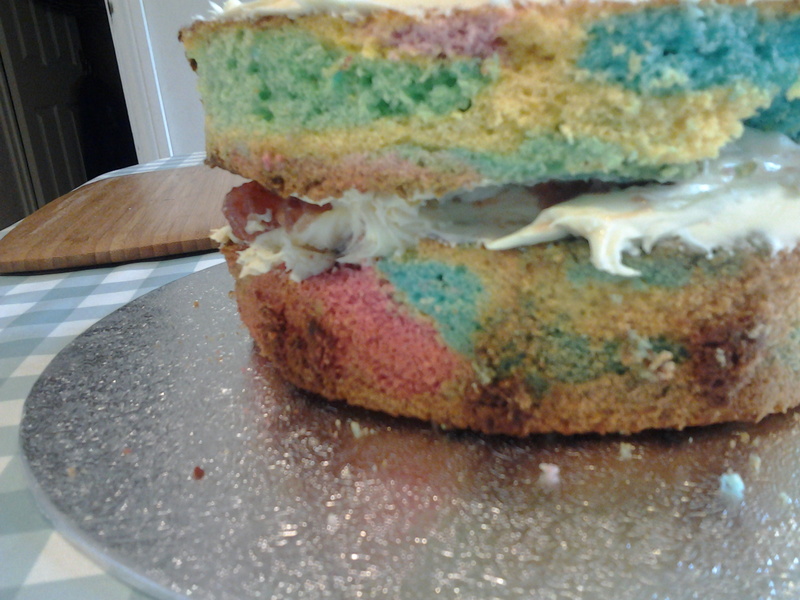 Inspired by both the colourful characters in the Cluedo game and a recent episode of Great British Comic Relief Bake-Off, I added 5 different food colourings – 1 to each bowl – and then marbled the cake mix in the baking tins. As I waited for the cakes to bake, I turned to my trusty laptop to search out some ideas for how to decorate G’s Cluedo cake and settled on recreating the board itself out of icing. Working late into the early hours of Sunday morning to finish this final part of the party preparations and when I finally fell into my bed at around 3am, I was delighted with the end results. The big reveal of my “showstopper” cakes was a huge success. Both G and M were thrilled with their cakes and liked the fact that even though they were completely different, they both fit our Cluedo theme perfectly. The cakes had pride of place at the centre of our Dessert buffet table and were a real talking point for children and parents alike. A job well done, though I’m not rushing to make 2 cakes for the same occasion again any time soon – my nerves just can’t take it! This entry was posted in Chronic Illness, EGID, Family, Food Allergies, Friendship, Parenting, Special Needs Parenting and tagged allergic reaction, Allergy, alternative cake, Awareness, Baking, Birthday, birthday cake, Cake, cake alternatives, Cluedo, Cluedo cakes, Cluedo-themed party, Dairy free, fake cake, Food, food allergies, friends, gluten-free, Gluten-free diet, home cooking, KitchenAid, KitchenAid food mixer, love, marble cake, NG tube, parenting, polystyrene cake, rainbow cake, rainbow marble cake, Special Diets, wheat free on March 6, 2015 by bluesingingdragon.